The Feinstein Junior Scholar Program began more than 10 years ago to promote community service projects to school children throughout Rhode Island. Alan Shawn Feinstein offers program membership to children who pledge to do good deeds for others. Today, there are more than 100,000 Feinstein Junior Scholars in kindergarten to college, and millions of good deeds performed. In Mr. Feinstein's own words: "I speak to over 35,000 of these youngsters each year in their schools – thanking them for what they are doing to help others and telling them that every time they do something good for someone else, they make the world a better place." Each week, Alan Shawn Feinstein comes to WSBE Rhode Island PBS studios to share some of those good deeds in Our Great Kids, short programs that recognize Feinstein Junior Scholars by name. The segments air on weekends on both of our channels, Rhode Island PBS and Learn. Mr. Feinstein tapes short (3-minute) and long (5-minute) segments, each with different content. In some Our Great Kids episodes, Mr. Feinstein reads letters he has received from children. In other segments of Our Great Kids, he shares advice and encouragement. Here's a link to one recent video. Past episodes are available on our YouTube channel. WSBE Rhode Island PBS transmits standard-definition (SD) and high-definition (HD) programming over the air on digital 36.1; on cable services: Cox 08 / 1008HD, Verizon 08 / 508HD, Full Channel 08, Comcast 819HD; on satellite: DirecTV 36, Dish Network 7776. WSBE Learn transmits over the air on digital 36.2; on cable: Cox 808, Verizon 478, Full Channel 109, Comcast 294 or 312. In this special edition of A Lively Experiment hosted by Dyana Koelsch, Rhode Island Representative Joseph Trillo (R) Warwick and Rhode Island Senator James Sheehan (D) North Kingstown/Narragansett debate the proposal to build a mega casino in the Quonset Point Business Park. Is your 'treasure' hidden in plain sight? Richard Conti of Conti Appraisal Service in Attleboro, MA, is an accredited senior member of the American Society of Appraisers (ASA), the National Association of Professional Appraisers, and the National Auctioneers Association. As a long-time supporter of Rhode Island PBS and the president of the Boston Chapter of the ASA, Richard is the station's liaison with the accredited appraisers participating in the Antiques Discovery & Appraisal Show coming to the Crowne Plaza Hotel in Warwick, RI on February 18. "Rhode Island is literally a treasure trove of original works of art and furnishings created by masters of their craft," said Conti. "There are the familiar names – Townsend and Goddard furniture of Newport, Gorham silver of Providence, the distinctive painting styles of Gilbert Stuart, George Hayes, and Maxwell Mays – all with strong roots in Rhode Island. There are also lesser known names who crafted beautiful works of art that are recognized by a signature style or shape. These, too, have become valuable and highly collectable through time." As a personal and real property appraiser and auctioneer for more than 20 years in New England, Conti has witnessed countless expressions of shock-turned-joy in his career. He tells the story of one man who requested Conti's services to help settle the estate of the man's elderly aunt. "I walked into the home and saw a painting on the dining room wall over the buffet. 'That's been hanging there since I was a boy,' the 50-something year old client told me. The painting was an original oil on canvas signed by Guy Wiggins. It was dusty, but worth between $35,000 and $40,000." Needless to say, Conti's client was astonished. "I see this all the time. A piece of furniture or a painting that has been part of everyday family life – and virtually ignored for decades – is actually a valuable antique, hidden in plain sight," Conti said. Even what was considered 'costume jewelry' in its day – pieces manufactured in Rhode Island by Monet, Coro, Trifari – demonstrate a type of American craft and artistry that has appreciated over time and become collector's items, according to Conti. "Masterful pieces created in Rhode Island over the centuries can be found all over the world," Conti said, "but there are still many originals right here in New England. Some objects never left, while others have made their way back home." If you're a fan of the British and American traveling appraisal shows we air on WSBE, then you likely agree that some of the best, most exciting moments are when unexpected treasures are discovered. New Englanders are invited to experience one of those moments of discovery for themselves at the upcoming Rhode Island PBS Antiques Discovery & Appraisal Show. The first event of its kind for WSBE - and a first-in-the-nation event for appraisers accredited by the ASA - the Rhode Island PBS Antiques Discovery & Appraisal Show provides a special and affordable opportunity for people all over New England to bring objects of unknown or uncertain value to an accredited appraiser for a written appraisal. Those two features – a written appraisal by an accredited appraiser – distinguish the Antiques Discovery & Appraisal Show from other antiques appraisal events in the region. You could be on TV! Throughout the day, while folks are in line for their written appraisals, Richard and the other accredited appraisers Elizabeth Clement, Elizabeth Clement & Associates, LLC of Danvers, MA; Michelle DuBois, Winston Art Group of Boston, MA; Leonard R. Polivy, Gordon Brothers Group of Boston, MA; Peter Sorlien, Peter Sorlien and Associates of Marblehead, MA; event sponsor Steven Fusco of Estates Unlimited, Inc., Cranston, RI, will alternately mingle in the crowd on the look-out for “hidden” treasures. In the meantime, TV producer and show host Brian Scott-Smith and the WSBE camera crew will be in the lines to film interactions, as well as in the formal appraisal area to capture those moments of discovery. Those stories will be edited together with additional footage, to create a television special that will air on WSBE’s two channels, Rhode Island PBS and Learn. The Rhode Island PBS Antiques Discovery & Appraisal Show will be held at Crowne Plaza Providence-Warwick Airport Hotel, 801 Greenwich Avenue (Route 5) in Warwick, RI, on Saturday, February 18, 2012, from 9 AM to 4 PM. One $65 ticket permits one written appraisal for one item, and admits one guest (two people). There is a choice of three admission times: 9 A.M., 11 A.M., 2 P.M., with tickets sold on a first come first served basis. Tickets must be purchased in advance - there will be no tickets sold at the door. There will NO buying or selling at the event. All appraisers are volunteering their time and expertise. Ticket proceeds benefit WSBE Rhode Island PBS. Tickets are available online at www.ripbs.org/antiques. For more information, including a helpful list of Frequently Asked Questions, visit www.ripbs.org/antiques. The Antiques Discovery & Appraisal Show is sponsored by Estates Unlimited, Inc. of Cranston, Rhode Island's premier antique and fine art auction company. 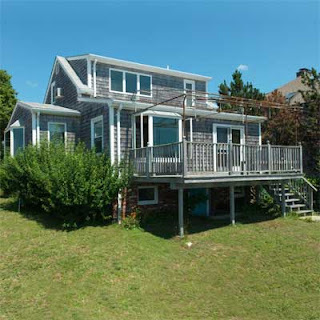 Pssst... come take a peek at the "New" Barrington Beach house! 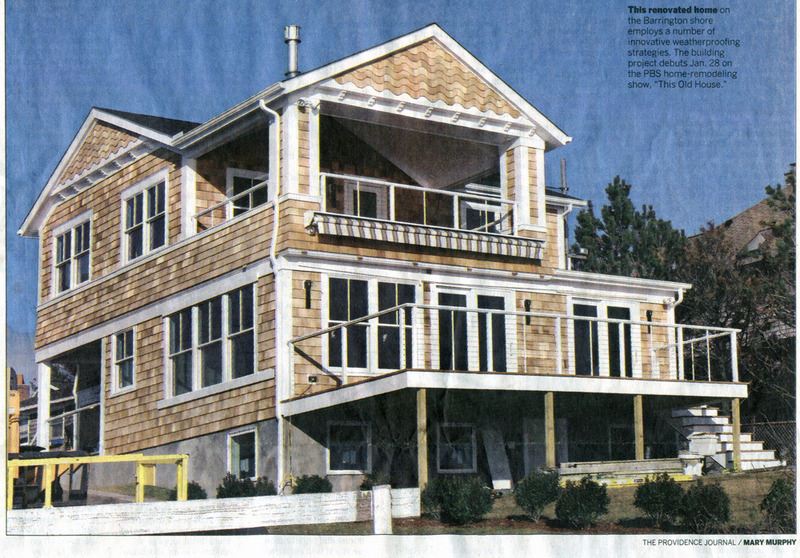 Saturday's (January 7) front-page story in the "Decor" section of The Providence Journal featured this huge half-page "after" photo of the Barrington Beach house project on This Old House! Please click on it for a larger view. 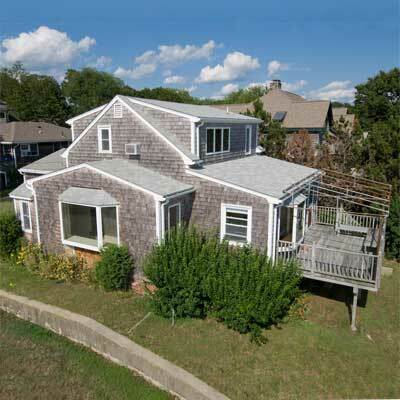 To actually see this sea-side cottage undergo its transformation, the first of 10 episodes (not 10 consecutive weeks) airs on WSBE Rhode Island PBS on Saturday, January 28 at 4:30 P.M. The following week, February 4, episode one repeats at 4 P.M., followed by episode two at 4:30 P.M. This scheduling gives you the option of watching the entire series at either 4:30 P.M. starting January 28, or at 4 P.M. starting February 4.